1847-1852—Alton and Sangamon Railroad completed. 1854—The line extended to Bloomington, as the Chicago and Mississippi Railroad. 1855—The line extended to Joliet. 1855-1856—Joliet and Chicago Railroad chartered. It was leased by the Chicago and Mississippi creating a continuous line from Alton to Chicago. 1862—St. 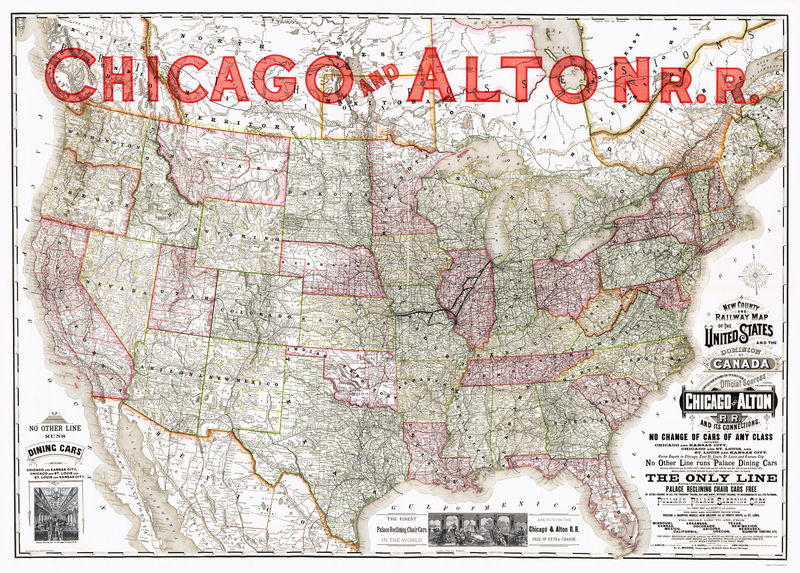 Louis, Alton and Chicago and then the Chicago and Alton Railroad were formed. 1863—Alton and the Pittsburgh Ft. Wayne and Chicago Railroad completed an agreement for the Alton to move from the Illinois Central depot, where they had been briefly, to the Pittsburgh, Fort Wayne & Chicago depot on Madison Street, later to become the Union Station, where the Alton resided until it’s demise. 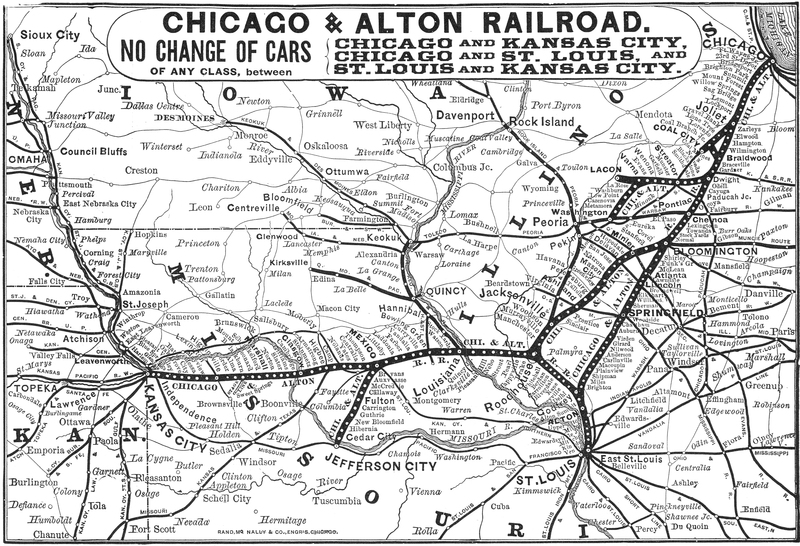 1864—Chicago and Alton chartered the Alton and St. Louis Railroad to complete its line to East St. Louis. 1870—Louisiana and Missouri River Railroad running from Louisiana to Springfield, Missouri, and the leasing. 1878—Kansas City St. Louis and Chicago Railroad running from Mexico to Kansas City, Missouri. 1906—Chicago and Alton Railway controlled at various times by the U. P., the Rock Island and Nickel Plate. 1947—Alton merged into Gulf Mobile and Ohio Railroad (Chicago & Alton name gone after merger). The Alton was the first railroad to install a sleeping car designed by George Pullman and built in the C&A’s Bloomington shops. This went into service on the Chicago to East St. Louis line on September 1, 1859. The Alton was the first railroad to install a dining car, the Delmonico, in regular service. It was built by George Pullman in the CB&Q Railroad’s Aurora, Illinois shops. Two more dining cars, the Tremont and the Southern were also built and leased by the Chicago and Alton, providing dining car service on all of its Chicago to East St. Louis trains. The Alton was the leading Railroad in Chicago to St. Louis service. MESSRS. PULLMAN & FIELDS’ NEW SLEEPING CAR—A short time since we noticed the fact that the St. Louis Alton & Chicago Railroad Company were about to introduce Sleeping Cars on that line. These cars have come to be an indispensable part of the equipment of a first class road and have long since passed all necessity of argument in their behalf. To enjoy a night’s rest on the cars, proceed on your journey with all the speed of flying wheels, the while you recline upon a comfortable couch, is a desideratum the force of which none deny. The difficulty has been how best to secure this end. How to secure the best requisitions for a car for night travel and yet in the least degree interfere with its comfort and commodiousness for ordinary day use, since such must be more or less expected of each car. We believe from our own personal knowledge of the matter, strongly confirmed by those whose opinion is of more weight than our own that each and every requisition for day and night use combined, have been secured in the Sleeping Car just invented and perfected by Messrs. Pullman & Fields, and that to a degree we have never seen excelled if equalled by any of the numerous varieties in use. The road above referred to have just adopted these admirable cars, and we are the more proud of them in that they are an Illinois institution throughout, having been turned out of the Bloomington car shop, and entirely too from wheel to roof a credit to the builders. The plan is not unlike others with which our readers may be familiar, in the feature of making a lower berth out of two seats, lowering from above them a wide berth slung closely to the ceiling of the car when not in use, but both operations are much simplified. The two seats with very little change become an admirable bed. The great advantage of the upper berth as here arranged is the leaving the area of the car free from unsightly and inconvenient standards and compartments; all is a clear space within, the roof being strongly trussed without to give the needed accession to its strength. 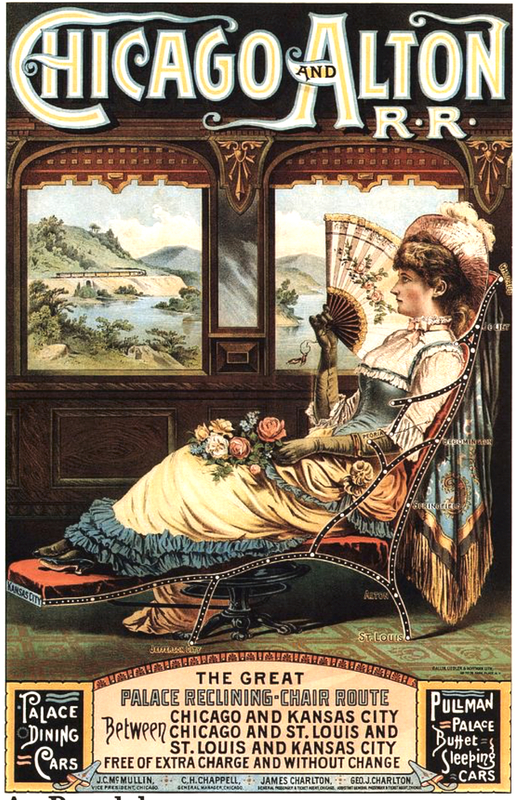 The car is fitted up elegantly, and has at either end various saloons and closets that would do credit for a steamboat, and are a novelty on the rail. Externally the car is elegant in appearance, and in operation we have cause to know it to be a perfect success if the verdict of travelers be any criterion. Much better success in ventilation has been secured and the occupancy of an upper berth has especially a free access to pure air. Yesterday afternoon Messrs. Pullman and Field with some officers and invited guests members of the city press and others went out to the Summit, the better to test the excellencies of the car. The universal verdict was in its favor. At the Summit the “make up” of one of the lower berths was given to “Edward” from John Wright’s, with the most perfect success, in a neat little collation. The whole affair passed off pleasantly. The railroad men will do well to consider the claims of the Pullman & Field style of Sleeping Car. It can be cheaply and easily adapted to the ordinary day car, and when the berths are all stowed is every way as serviceable in day trains, quite a desirable feature and lacking in most sleeping cars. 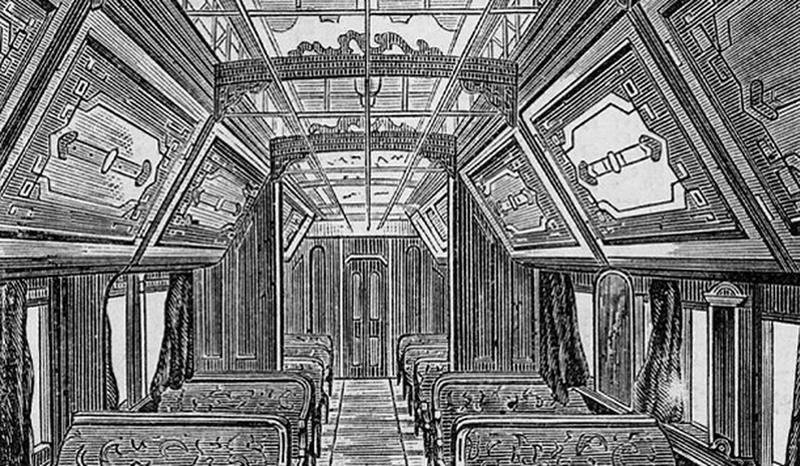 We present herewith an engraving showing an inside view of one of the Drovers’ Palace Cars, which the Chicago & Alton Railroad has recently introduced upon its lines. The novelty of the design, and its bearing upon the great stock-carrying interest here in the West, warrants its special notice in this issue. These cars are attached to the stock trains on this road, and are fitted up with all the conveniences and luxuries of a Pullman Palace Car. The sleeping apartment, occupying one-half of the car, is for the exclusive use of drovers and men in charge of the stock, and is provided with eight double berths and coaches with spring beds. The other half is for the use of train men, and is furnished with side seats (as shown in cut) with a cupola or lookout, enabling train men or drovers to pass out readily, and giving them easy and safe access to any part of the train. The utility and convenience of this arrangement must be apparent to every one at a glance, and the present magnitude and rapidly augmenting importance of the stock interests, amply warrants the enterprise and foresight which prompts this road, always among the first to adopt any improvement conducive to the safety and comfort of travelers, to add to their already superior facilities something which shall materially better the accommodations of a large and important class of their patrons. 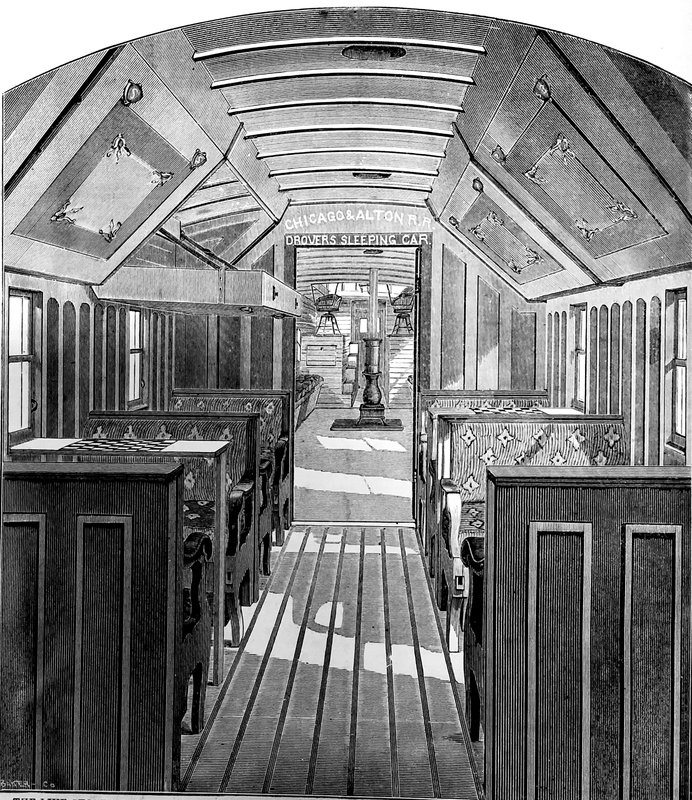 THE LIVE STOCK TRADE.—Interior of the Drovers’ Palace Car, run on Chicago, Alton & St. Louis R.R. It may not be generally known to what extent this Southern Kansas, Missouri and Texas cattle market is opening up to the wants and needs of Chicago and the East, and the direct instrumentality which the Chicago & Alton Road is exertiung in bringing it about. In view of the importance of this new interest, and the probable changes which will be wrought by it in the general market here and at the East, it may be interesting to our readers to consider, for a moment, the facilities which are opening up for the development of this inexhaustible Southwestern cattler supply. The Chicago & Alton Company now operate nearly 700 miles of road, and are rapidly extending their lines to the West and Southwest. For instance, the new Chicago and Kansas City short line, recently opened, leaves the main road at Bloomington, passing through Jacksonville and crossing the Mississippi river at Louisiana on the great iron bridge lately completed there, connects with the St. L., K. C. & N. R. R., with which it has intimate relations at Mexico. Over this line it runs its cars, both freight and passenger, between Chicago and Kansas City without change. The Southern branch, moreover, is completed from Mexico to Jefferson City, the capital of the State, and connection is made with the Missouri Kansas & Texas Road at Moberly, about 88 miles west of Mexico, thus forming almost an air line from Chicago to Fort Scott, Southern Kansas and Texas. Close connections are also made with every other line at Kansas City and St. Joseph to all points West and Southwest. So it will be seen at a glance that the Chicago & Alton Road in this way, opening up and reaching vigorously out for this new and immense field of enterprise, will undoubtedly secure a large share of the trade of that territory; and we repeat, the company can well afford to make its facilities for the accommodation of so large a class of its patrons as the stock dealers are going to be, in every respect superior, and we sa=hall expect to see Drovers’ Palace Car speedily adopted on other roads, where the magnitude of the interest will warrant it. The Chicago & Alton Railway had built a special train to go into fast daylight service from Chicago to St. Louis and wanted it photographed. Mr. Charlton, the director, believed his train to be the handsomest in the world and he wanted a photograph of it, six long Pullmans, engine, tender and all. He called the company’s photographer, George R. Lawrence, and instructed Mr. Lawrence that it was necessary to have a photograph 8 feet long of the ” Alton Limited. ” The photographer explained that the train would have to be photographed in sections, and these sections fitted together during the process of printing. 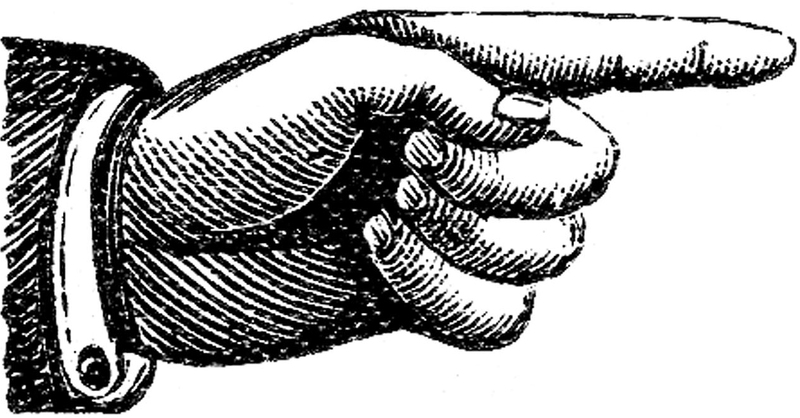 But he felt obliged to add that this was an ordinary method which was not conducive to absolute truthfulness of perspective, and one which would certainly show the joints, no matter how carefully the different sections were blended together. The plates for this gigantic camera are also the largest ever manufactured. They are made in St. Louis, and have to be coated entirely by hand. They cost $70 per dozen. Five gallons of developer arc used to develop one plate, and the services of eight men arc required to manipulate it during the process in the dark room. The camera was transported on a flat freight car, but when away from the railway was moved in a specially padded van. Fifteen men were necessary to handle and set up the monster camera, to focus and photograph the train. Largest train in the world, Cavalry in foreground mounted on horses. My Fire Department ordered some pictures of old steam pumpers for our day room. One of them was a steam pumper going down a city street. In the background is the Chicago and Alton Railroad Office. Near the pumper is a city rail tram car from the M S Railway with Broadway marked on it. We did a search trying to date the photo. Greenland New Hampshire Fire Department.. Apparently there is some confusion concerning the panoramic photograph that George R. Lawrence made with his mammoth camera during 1900. The Library of Congress owns “Alton Limited” panoramic photograph shown . However, it was not made by George Lawrence’s “mammoth camera” during 1900. George Lawrence made this “Alton Limited” photograph during 1905. The photograph is only 39.5 inches long and depicts the “Alton Limited” after it was re-equipped with a 4-6-2 Pacific steam locomotive pulling 8 Pullman Heavyweight cars. I would just like to correct one small piece of information submitted in the previous post from Tom Mosele. Mr. Mosele points out that this is a photograph of the re-equipted “Alton Limited.” This is true. However, It is not with one of the famous red Alton 4-6-2 Pacifics. I was just examining a high definition version of this photograph and came to the realization that the locomotive pulling the “Alton Limited” in this photograph is a 4-4-2 Atlantic. Having known how colorful Alton Road’s paint schemes were, makes me consider that this locomotive was most likely red but the fact that this is a black and white photograph makes this impossible to tell. One can note that this is a 4-4-2 Atlantic because the locomotive is relatively short and the main driving rod straight from the cylinder connects to the rear set of wheels. The Chicago and Alton had a set of two series of Atlantics. The first series were classified as E-1’s. These were built in 1903 and superheated in 1920. The E-1’s were numbered 550-553. The second series were built in 1906 and 3 of the five built were also superheated in 1920. These were classified as E-2’s and numbered 554-558. I was not able to determine which class of 4-4-2’s is in this photograph. The one I looked at was not that clear.